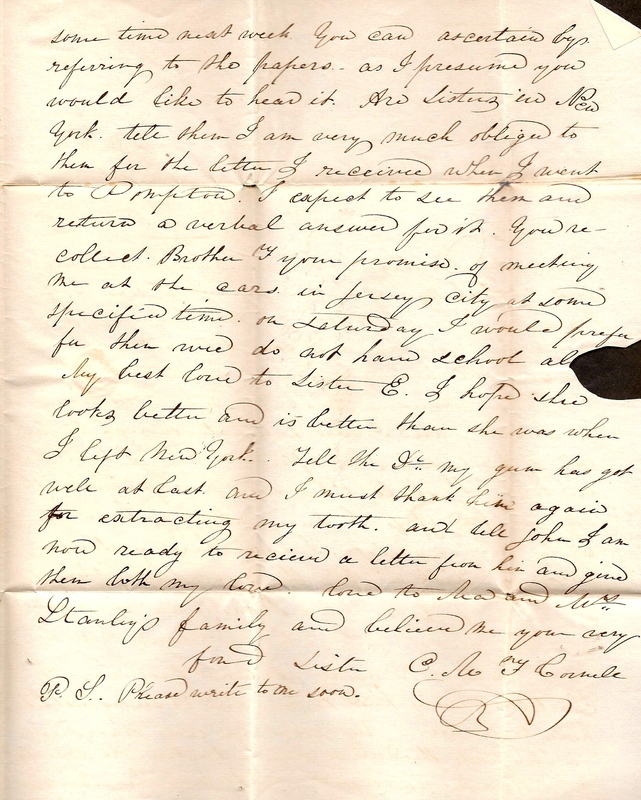 This letter was written by Charlotte Mercer Cornell (1822-18xx) to her much older brother, Rev. Frederick Frelinghuysen Cornell (1804-1875). They were the children of Rev. John Cornell and his wife, Maria Frelinghuysen, daughter of General Frederick Frelinghuysen of the celebrated New Jersey family. Rev. 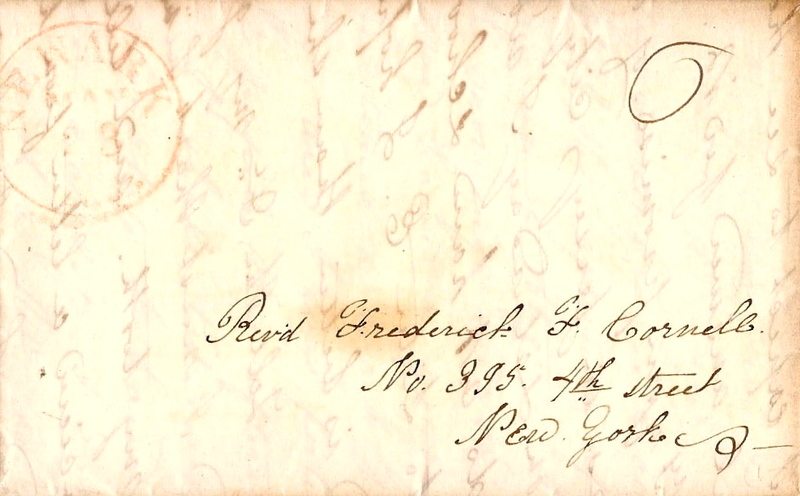 Frederick Cornell graduated from Princeton (1825), and the New Brunswick Theological Seminary (1828). He became a member of the Newtown Presbytery in 1829; professor of languages, College of Mississippi, at Natchez, 1828-29; missionary at Stuyvesant for three months in 1829; at Columbiaville, 1829-31; at Marshallville, 1831-32; Montville, 1833-36; pastor of Manhattan Reformed Dutch Church, New York City, 1836-56, and pastor of Pluckemin Presbyterian Church, 1856-64. In 1866 he received the degree of Doctor of Divinity from Union College. He married Elizabeth Clock Bell (1822-1882), daughter of Jacob and Phebe (Clock) Bell. Charlotte Cornell married John Van Allen (1811-18xx) in 1858. 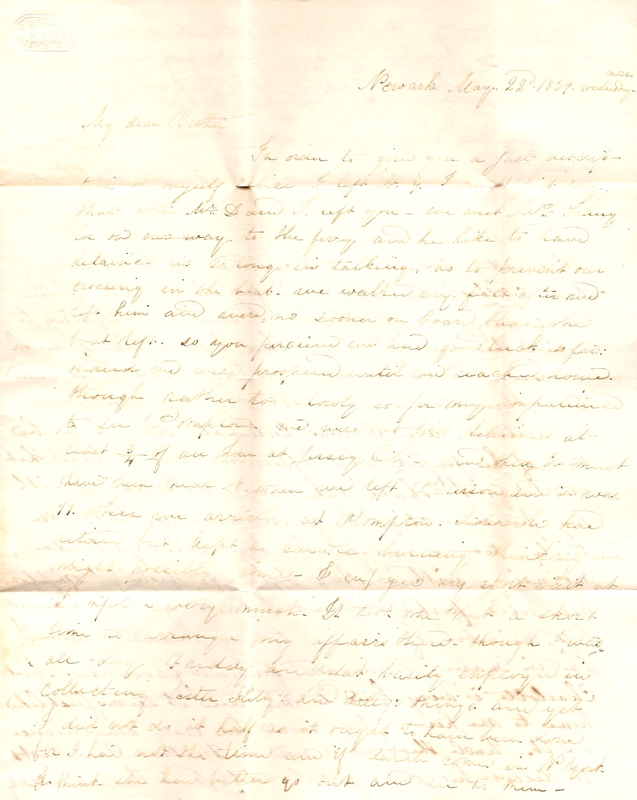 We learn from this letter that while attending school in Newark, New Jersey, Charlotte resided with her uncle Senator Theodore Jacobus Frelinghuysen (1787-1862) and his wife Charlotte Mercer (1791-1854). 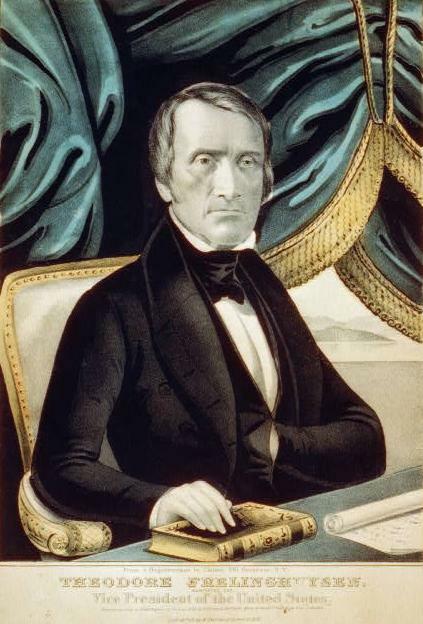 Frelinghuysen is probably best known as Henry Clay’s running mate on the Whig Ticket during the Presidential Campaign of 1844. In order to give you a just description of myself since I left New York, I must first say that after Mr. D. and I left you, we met Rev. S_____ on our way to the ferry and he like to have detained us so long in talking as to prevent our crossing in the boat. We walked very fast after and left him and were no sooner on board than the boat left. So you perceive we had good luck so far. Indeed, we were prospered until we reached home, though rather too slowly so for my impatience to see Pompton. We were at first detained at least 3/4 of an hour at Jersey City. And then we must have been near 8 when we left Patterson and it was 11 when we arrived at Pompton. Sister M. had returned but kept a candle burning thinking we might possibly come. I enjoyed my short visit at Pompton [New Jersey] very much. It took me but a short time to arrange my affairs there, though I was all day Friday and Sat. busily employed in collecting Sister Kitty and Lilly’s things and yet I did not do it half as it ought to have been done for I had not the time. And if Sarah comes in New York, I think she had better go out and see to them. Monday morning. I made my farewell calls and in the afternoon received many. I did not think before I was so much thought of at Pompton for they endeavored to persuade me they could accomplish nothing without me. 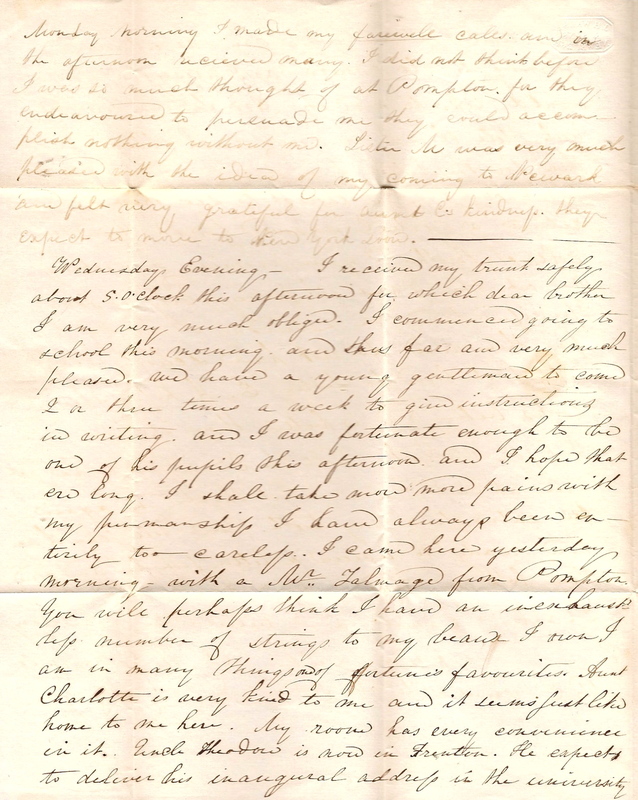 Sister M. was very much pleased wit the idea of my coming to Newark and felt very grateful for Aunt Charlotte’s kindness. They expect to move to New York soon. Wednesday Evening. I received my trunk safely about 5 o’clock this afternoon for which, dear brother, I am very much obliged. I commenced going to school this morning and thus far am very much pleased. We have a young gentleman to come 2 or three times a week to give instructions in writing, and I was fortunate enough to be one of his pupils this afternoon and I hope that ‘ere long I shall take more pains with my penmanship. I have always been entirely too careless. I came here yesterday morning with a Mr. Talmage fom Pompton. You will perhaps think I have an inexhaustless number of strings to my beau. I own I am in many things one of fortune’s favorites. Aunt Charlotte is very kind to me and it seems just like home to me here. My room has every convenience in it. Uncle Theodore is now in Trenton. He expects to deliver his inaugural address in the university some time next week. You can ascertain by referring to the papers, as I presume you would like to hear it. A___ sisters in New York. Tell them I am very much obliged to them for the letter I received when I went to Pompton. I expect to see then and return a verbal answer for it. You recollect, Brother F., your promise of meeting me at the cars in Jersey City, at some specified time on Saturday. I would prefer then [since] we do not have school all day. P.S. Please write to me soon.